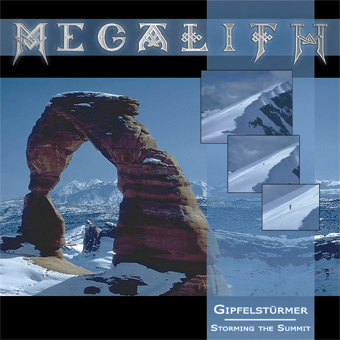 Our new masterpiece »Gipfelstürmer / Storming the Summit« features 14 tracks with a total playing time of 54 minutes and a very comprehensive and carefully designed 28-page booklet with all lyrics, many quotes, information on our literary references, illustrations etc. (of course, most of this content is German). The very costly production of »Gipfelstürmer / Storming the Summit« resulted in a very powerful, professional and transparent sound. If you should already have embraced the digital age and prefer the MP3-format, you can buy the album in 256 Kbit quality with a PDF-copy of the booklet and artwork. This way, you do of course save the postage cost. After payment, you will receive a download link with a Win-Rar package. A broadband internet connection is advisable. For MP3-samples of »Storming the Summit« click here! For reviews to »Storming the Summit« click here!